Effectively dressing wounds and ulcers has long been a challenge for medical staff and professionals. This is especially true for elderly patients who suffer from pressure sores, handicapped patients who cannot adjust their limbs to avoid accruing sores and those who cannot reposition themselves independently. 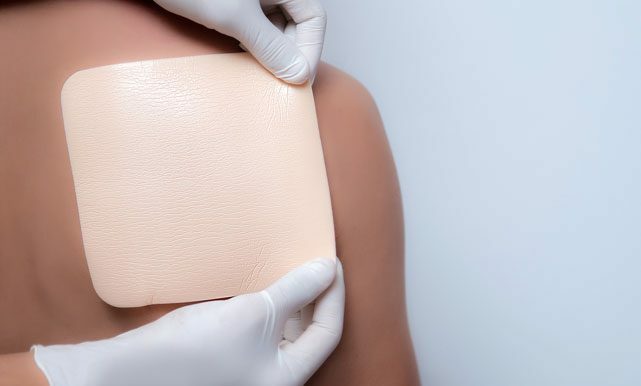 Fortunately, advances in wound care and wound care dressings, have been significant enough to allow for dressings to remain in place longer while offering greater resistance to microbes and infection. Three types of wound dressings represent major innovations in wound care. They are; hydrocolloid dressings, hydrogel dressings, and foam dressings. These dressings feature a special design containing a gelatin application surface which is held in place by a specially formulated adhesive. When applied, the bandage is self-adhering and water proof- providing a strong seal against the skin from the external environment. Best of all, the gelatin compound does not adhere to the wound itself. This allows the bandage to be changed without the loss or disruption of scab formations or other recently healed tissue. The adhesive, however, does stick to the surrounding intact skin. This makes an excellent seal within which an ideal environment for both protection and healing to take place. These dressings have the disadvantage of not allowing for air or fluid exchange which can be detrimental to healing if left on too long. These dressings are meant to endure in situations where they may be damaged. These advanced dressings were designed to facilitate the exchange of fluid on the surface of a wound. Unlike Hydrocolloid, they provide a semipermeable surface that allows the normal discharge of sodium to take place as damaged tissue is replaced and covered over by healthy tissue. These bandages are usually composed of about 90% water suspended in a gelatin base. Some hydrogels have a cooling effect on the wound which helps to reduce the pain felt by the patient. While hydrogel bandages are excellent for promoting healing by permitting fluid exchange, they are not as resistant to damage and infection as Hydrocolloid. Hydrogel is best used in strictly controlled medical settings where damage to the dressing is a minimal risk. Foam wound dressings are specially designed to address one of the most pressings requirements of wound care, the creation of a moist environment which is conducive to healing. These semipermeable polyurethane wound dressings do not attract lint and do not adhere to the wound. The sponge-like nature of the foam material used has the dual effect of holding moisture while allowing air to move around the treated area. These dressings are ideal for wounds with a high volume of exudate to be removed, otherwise, the wound may become excessively dry.